HomeBlog Eliminating Explosion and Fire Ignition Hazards Posed by Electrostatic Discharges. Eliminating Explosion and Fire Ignition Hazards Posed by Electrostatic Discharges. Electrostatic discharges pose a significant ignition hazard when used with flammable substances (gas, vapour & dust) and can lead to fires and explosion. Static discharges can also pose an occupational personnel hazard, lead to electronic component failure and manufacturing product problems. Mitigate the possible effects of an explosion and fire hazard in your workplace by eliminating the ignition hazard posed by static discharges. By carrying out an a thorough inspection of your plant and measuring electrostatic surface voltage you will identify the sources of static generation and potential deficiencies or lack of controls that may lead to static generation. We define electrostatic discharges as a generic term for sparks. All electrostatic sparks in air occur because the high potential (voltage) gradients across a charged surface is sufficiently high to ionise the air in its vicinity. This leads to a conducting path through the air across which the charge (spark) causing the potential gradient can transfer. Charge accumulation occurs when the rate of charge generation exceeds the rate of charge dissipation to earth. The hazard of charge accumulation usually increases with area volume. There are environment conditions that are required for static electricity to become a source of Ignition. The rate of charge generation must exceed the rate of charge dissipation. The effective energy must exceed the minimum ignition energy of the flammable atmosphere, a static discharge must coincide with a flammable atmosphere and a locally ignited flame must propagate in to the surrounding flammable atmosphere. We also distinguish between three types of electrostatic discharges. There are spark discharges which occur between two ungrounded and charged conductors with a minimum Ignition energy (MIE) ~ 100 mJ. We also have brush discharges which occur between insulating material and a conductor or even between two insulating materials with a MIE < 3 – 4 mJ. Finally we have a propagating brush discharge which occurs between two insulators. The energy dissipated can be very high ( MIE >1000 mJ) and it will ignite most flammable atmospheres. 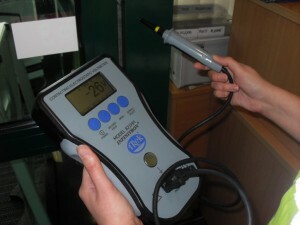 At each test location of your assessment a calibrated handheld electrostatic voltmeter should measure and record the polarity of static charge (positive or negative), electrostatic surface voltage, maximum and minimum volts, ambient temperature and relative humidity. At CMSE one of our consultancy aims is to support both industry and our clients in eliminating the ignition hazard posed by static discharges and therefore eliminating and mitigating the possible effects of the explosion and fire hazard in the workplace. We perform Static Survey Assessments for defined areas and activities within the plant where static may pose an explosion, occupational personnel hazard, lead to electronic component failure and manufacturing product problems. If you need help, assistance or interested in finding out more, please contact our Consultants; Gary Horgan at [email protected] or Yolanda Gomez at [email protected] or visit https://www.cmse.ie/consultancy/process-safety/process-consultancy for more information.